December 6, 2017 "Instructions For Form 1045 - Application For Tentative Refund" contain the updated filing procedures for the IRS-issued Form 1045. Download your copy of the instructions by clicking the link below. IRS Form 1045 is tax form released and collected by the Internal Revenue Service of the United States. this portion is less than 100 square feet. The NOL for the tax year. that earlier year was filed. power plant (or any unit thereof). 2. The NOL for the tax year. which the act (or failure to act) occurred. For details, see section 172(f). 301.9100-2” on the election statement. need to use additional Forms 1045. Schedule A on only one Form 1045. Form 8960; and Form 8962.
to a math or clerical error on the return. of the return for the applicable tax year. computation of the NOL carryover. A, D, and J (Form 1040), if applicable. which you request an adjustment. trusts that contribute to the carryback. to file your 2017 income tax return. Tax Refund of $1 Million or More. For more details on NOLs, see Pub. Tax—Individuals for each loss year. line 10 for each pair of columns. before the date of filing the application. Forms 1045 to carry back an NOL. (Form 1040) for each carryback year. For more details, see section 1212(c). 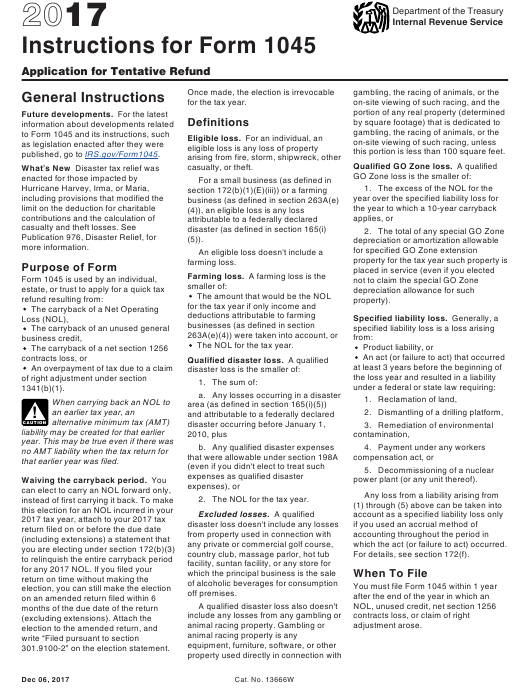 disaster loss, or a specified liability loss. return to claim refunds for those years. can be carried forward up to 20 years. NOL can be carried back 3 years. of which only $5,000 is an eligible loss. than $5,000 in the 3rd preceding year. on your original or amended return. be carried forward up to 20 years. NOL can be carried back 5 years. $15,000 loss is carried back 2 years. carried forward up to 20 years. Line 40 for 2007 – 2008. Line 37 for 2007 – 2009. Line 24 for 2007 – 2008.
carryback. For details, see Pub. 536. $5,350 for 2007 ($10,700 if married). business credits for years before 2008). Line 39 for 2007 – 2009.
carryback” for the applicable year. 2016 Instructions for Form 8962. $3,400 for 2007 ($6,800 if married). you to owe alternative minimum tax.